Born in Ottawa, Paula Murray studied science at the University of Ottawa and ceramics at Sheridan College. Living and working on the shores of Meech Lake, Québec since 1980, her life has been enriched by several years living on the water sailing with her young family sailing between Canada to South America. This ongoing relationship with the sea and the elements has intensified her appreciation of the ephemeral nature of our presence. Her long time interest in the nature of reality has been informed by her discovery and study of The Baha’i Faith. 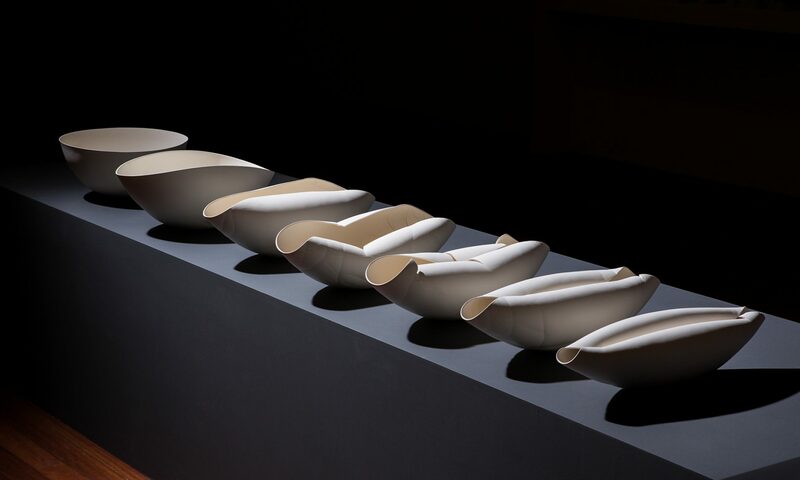 Elected into the International Academy of Ceramics in 2017 and the Royal Canadian Academy of the Arts in 2006, she exhibits internationally having received honourable mentions for prestigious competitions in Italy, Korea and Taiwan and Japan. In 2015 she was awarded the Prix du Conseil des arts et des lettres du Québec for Work of the Year for her installation Connection x Connexion and Artist of the Year for the Outaouais region. Selected collections include Korean Ceramic Foundation Museum, New Taipei City Yingge Ceramic Museum, Museum of Ceramics, Faenza Italy, Canada House, London, UK, and in Canada the Gardiner Museum, Museum of History, City of Ottawa and the Canada Council Art Bank and The Canadian Clay and Glass Gallery.